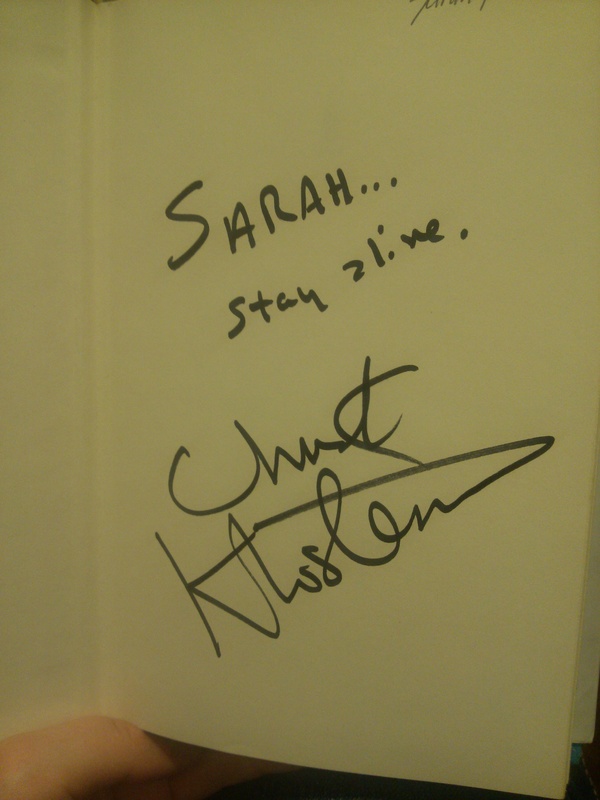 When I was 18, I met Chuck Klosterman. I went to see him do a reading for the paperback release of his book Killing Yourself To Live: 85% A True Story with my best friend from high school (whom, because of this book, I’m always tempted to refer to as Mr. Pancake.) We read about it in the Philadelphia City Paper. He read in a, now defunct, Borders Books on Walnut Street. Klosterman was wearing jeans, Nike running shoes and a The Velvet Underground & Nico tee shirt. It was the first time I had seen him with a beard, as all his press photos were clean shaven until then. (This might’ve been a subliminal start for my lust for beards?) It matched – and still does – his poindexter, black, horn rimmed glasses. 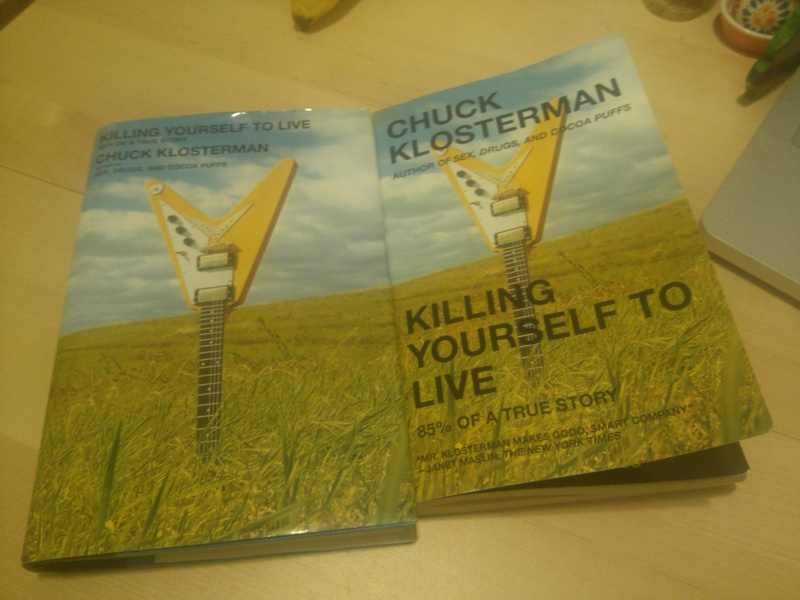 I have the hard back first edition of Killing Yourself. I can tell you where and when I bought it because it’s an insanely trivial point in my life that ended up hugely impacting everything about me. (Klosterman is probably why I started writing. This book is proof that you can write about what you want, how you want. He makes it that simple.) I bought it at the Borders Books (hmm, coincidence?) in Saratoga Springs, NY when I spent a week staying with my sister – who was living there in between her junior and senior year at Skidmore College. I’m assuming he read a piece of it aloud, but I only assume because I have no idea what it was, if it was. It was the colorful Q&A session with the packed crowd that lasts in my memory. I’m re-reading Killing Yourself for the first time since it came out in 2005. Klosterman is terrific. He knows how to write, how to get a point across and seems to have (then and now) slogged through enough waste-high dog crap that we should listen to what he has to say. Klosterman writes about music without snobbery because he seems to understand all music. He can argue the value of Bon Jovi and Ratt, tell you why Interpol is stupid as he’s classifying the type of stoner who sits around arguing about the meaningless meaning of CCR. But he still makes sense – about all of it. I haven’t read this book since I was 17. And when I was 17, my brain worked in a different way than it does now. I probably missed more than half of what he’s actually talking about then. But now I see why he’s The Ethicist for the New York Times Magazine. There’s a lot we can learn from Klosterman. He is a unique writer and Killing Yourself To Live is his best work. OK, that and it’s younger brother CK IV: A Decade Of Curious People And Dangerous Ideas. (Which has an amazing Jeff Tweedy interview in it. An interview that happened just days before Tweedy checked himself into rehab, right before A Ghost Is Born came out.) His sentences are structured effortlessly and his ability to recount the past (hence the 85% A True Story) is impressive. The amount of detail he writes with should require you to take notes while reading his books. I do. Klosterman doesn’t have perfect observations. But what he’s noticing is perfect. He notices things that no one usually cares about, he writes about how rain sounds against the hotel wall, what subculture hippies thrive off of, how many chicken farms there are in rural Mississippi and – the famous? – how Radiohead’s Kid A is a soundtrack to what happened on September 11th. The detail in which he talks about music, certain songs, their run time and how they were making him feel as a child pulls you in. It’s precise, admirable, sure of itself writing. Juxtapositions are also what makes Klosterman himself. It makes him readable and relatable. Comparing two things that have nothing in common is witty and stupid. See how that works? It makes you think two opposite, vapid yet meaningful things about the same idea. He also varies the length of his paragraphs, which I had read about in a Rules For Writers book once before. It’s a fun habit to get into and it helps shove a story forward. That day in Philadelphia, I got him to sign my book. He wrote in it, “Dear Sarah, Stay Alive. Chuck Klosterman.” I don’t know if I’ve ever cared enough to figure out what he was trying to say by Stay Alive. Was he trying to make a KISS reference? Was he trying to be witty and unusual? Or was it the first thing that popped into his head? Because he hates signing peoples’ books and complains about it to his best-selling friends? We’ll never know/I plan to find out when I meet him again one day. Killing Yourself To Live is an assignment/concept book he wrote while working at SPIN Magazine. He travels around the country in a rental car visiting the actual sites where rock stars died. It reads like a funny travel journal full of encounters with locals and mind numbing, fascinating anecdotes about dream space. So much has changed since it’s publication: now we have iPhones and cloud space. SPIN doesn’t even print magazines anymore. He talks about taking 600 CDs with him on his trip and thouroughly describes what a GPS is. It’s like a time capsule. I bought a second copy of this book, used, on Saturday. And I’m pretty sure I’m devouring it quicker the second time around. But instead, I’ll tell you that he has a new book coming out in July. And until then, you can read all his other books, emulate his writing, make jokes and fill up your thoughts and journal with internal narration. Which is what Klosterman really is: an internal narration of American music and culture. Klosterman tells us that nothing it relevant while everything is meaningful. He tells the story that what we actually love, doesn’t really matter. He has an imagination for vocabulary and a head full of details on everything you thought you never cared about, until now.